Hang onto your bowler hats, agents Books and Braun of Britain’s top-secret Ministry of Peculiar Occurrences are back in The Janus Affair. In their second wildly imaginative, utterly fantastic steampunk adventure, authors Pip Ballantine and Tee Morris carry readers back to an alternate history Edwardian England, where suffragettes are inexplicably disappearing in flashes of lightning, and the brainy, intrepid Mr. Books and his partner, the fearless, lovely, weapons-loving Eliza Braun, must get to the bottom of the nefarious matter—while confronting high-flying assassins, a traitorous turncoat, and the Queen of the Underworld herself. 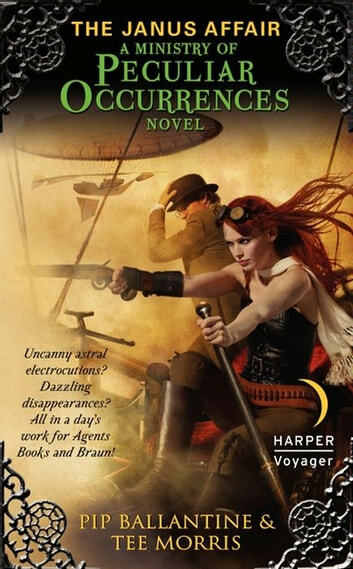 The Janus Affair is the British TV classic, The Avengers, updated for the 21st Century and given a delectable steampunk twist—an Affair that will satisfy fantasy lovers, graphic novel aficionados, and dedicated fans of the novels of Gail Carriger.